RMA Software | InFOREMAX Inc.
Automate report generation and the flow of business-critical information! A feature rich system, designed to automate the labor intensive and time consuming processes of dealing with customer returns. It provides a user-friendly interface to the Customer Support team for data entry of customer and product information. Upon entering this information, an RMA number is generated and a notification is sent to the service staff via email. InFOREMAX RMA Software generates repair quotations and invoices for non-warranty items. By automating the paperwork generation of RMA process there are significant savings in both time and manpower resources. The analysis and report tools also allow users to create statistical reports which include Profitability Analysis, Parts & Labor Cost Analysis, Total Defective Materials Count, Product Failure Analysis, Turnaround Time Analysis and RMA cases reviews. InFOREMAX RMA Software provides the tools that enable an organization to run its Repair Center as an independent business. 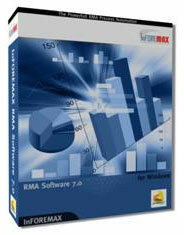 InFOREMAX RMA Software is compatible with Windows Vista, Windows 7 and runs under Microsoft .NET 3.5. When you buy InFOREMAX Software you make a one-time purchase without any royalty payment. There is no upfront cost to start using InFOREMAX. You get a 15-day trial account 100% free of charge, and then pay the lowest monthly fee. Do you need a web portal that allows your customers to submit their Return Request and to track the progress of the return on-line? InFOREMAX is proud to offer a cloud based web portal, integratable to your corporate website.